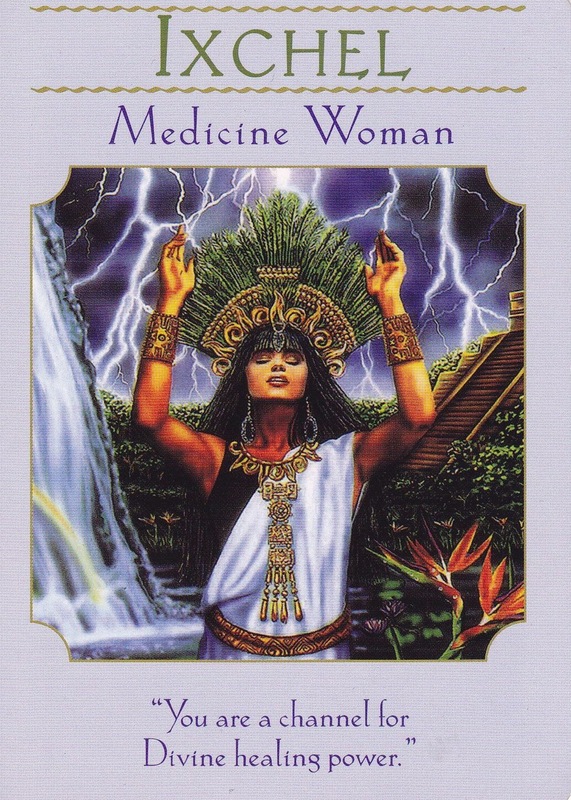 Card: Ixchel – from the Goddess Guidance Oracle Cards by Doreen Virtue. Note from Erin: I’ve been sick for the last 5 days, and today I’ve been feeling like a little kid wanting to throw a big tantrum. I had a pretty good laugh when I pulled this card – those rascal Faeries teasing me. It brings up a question for me: how do I conjure up a commanding energy for healing when I’m feeling so rotten? I really just feel sorry myself right now and I feel entitled to feeling better, lol. Message from the Faeries: When you are not in a good place – when you are feeling down, unhappy or unwell – it can be difficult to be at a place of grace and dignity. When you are suffering, it is not easy to feel safe or be from a place of gratitude. When you are sick, it’s hard to see yourself as the healer. Even when you are not feeling healthy, you are still the healer. You just have to find that space where you can calm your mind, and relax your soul. When you find the inner peace, you can find the grace to accept the healing into your life. Being in a relaxed and calm state will allow you to be in a place of acceptance: you are sick today, but it doesn’t mean you will be sick forever. This is where you are now, today. Be in the moment. You can command healing for yourself and others when you trust and know that everything is happening in the moment, now, for a reason. It is all part of your journey. Sickness and health are all part of the ride. Try to relax and enjoy the whole thing – not just the parts you think are good – it is all good whether you know it or not. 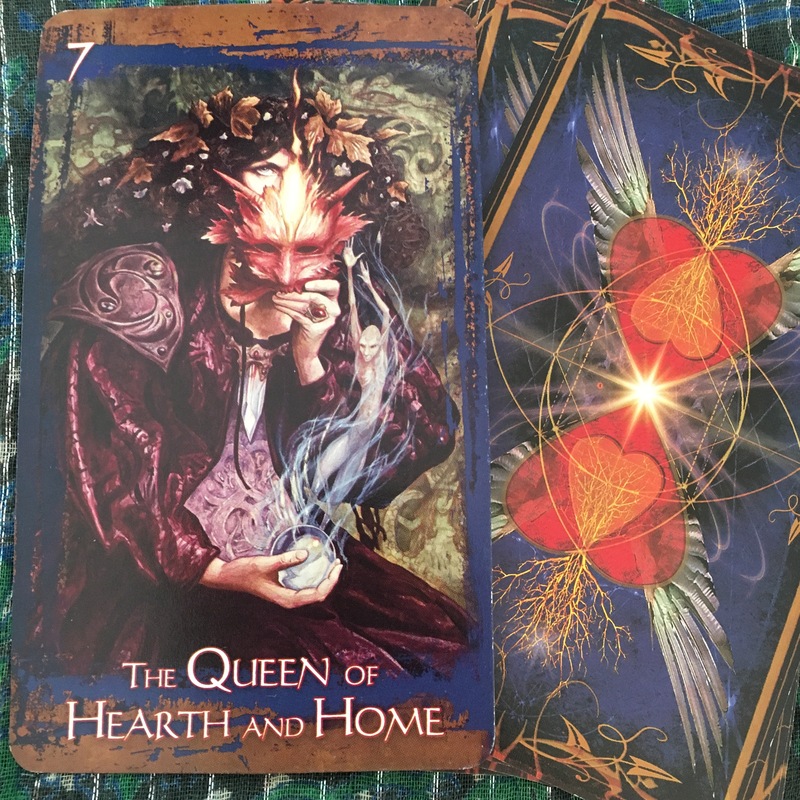 Card: 7 Queen of Hearth and Home – from The Heart or Faerie Oracle Cards by Brian and Wendy Froud. Message from the Faeries: This week’s reading is related to last week’s reading. Last week we talked about the importance of compassion, and how much the world needs it right now. Now more than ever. Compassion makes the world more hospitable. This faerie queen is here to remind you have of the importance of hospitality. Hospitality isn’t just about giving people a nice place to sit or sleep, and it isn’t just about offering fresh food and drink. Hospitality is about showing people grace in your space. Your space is whatever is all around you at any given moment. It can be a challenging being gracious with your space when you live in such an unfriendly environment where most people seem so selfish with their space. How many times of you sat on a bus, only to feel your own space infringed upon by the person sitting next to you who insists on sitting with their legs wide open. We’re certain you can think of countless examples of people being in hospitable. This behaviour is mostly due to a lack of awareness of what they are doing. It’s really not personal they truly just aren’t aware. See the mask this Queen is wearing? She is slightly lowering it down because she is getting ready to tell someone that they are being inhospitable and she is going to gently remind that they are sharing a space with other people. We encourage you to lead by example this week, and we want to tell you that it’s okay to tactfully and gracefully tell someone if they aren’t reciprocating with the hospitality. Sometimes people just need a little nudge. Chances are they just aren’t paying attention and are not living in the moment like you are.